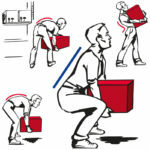 Manual handling techniques are easy to remember and can protect you from injury due to incorrect lifting and workplace actions. Manual handling refers to the movement or support of an item or objects a person handles by hand or by using bodily force. This applies to lifting, carrying, pulling, pushing, putting down and handling. There are regulations in place to help reduce the risk of accidents and injuries at work. While the actual risk itself cannot be eliminated, training can help reduce the likelihood of injury caused by the practice of poor manual handling techniques. Safer handling is not limited to workers on the factory floor. Injuries can also be sustained by individuals working in offices lifting small objects, especially if they are reaching and twisting. In short, manual handling affects every worker and every employer in some way. The Health and Safety Executive have found that poor manual handling techniques have attributed to more than 25% of all reported accidents. In some occupations, these figure is increased to over 50%. Over one-third of injuries that resulted in over three days off work were a result of poor manual handling technique. Safer handling-related injuries and illnesses cost UK businesses approximately 12 million lost working days a year, which is estimated by the HSE to cost businesses around about £5.7 billion a year. Reducing the number of manual handling injuries is not just about saving businesses money, there are also thousands of pounds lost to individuals in lost wages and in a reduction in their ability to carry out their chosen career, and it can have even more serious long-term implications. The techniques that you will learn on this course are easy and simple to remember. But in order for them to be effective, you must remember to use them every time you are involved in moving or handling an object.